Paint has always been a popular method of decorating things and preventing the materials underneath from rusting. Therefore, many people consider the option of painting their log cabin. However, paint doesn’t prevent logs from rotting. In fact, the use of paint on logs can cause the logs to rot faster. This makes it very important that we avoid painting our log cabins. It’s not a good idea, it’s actually a very bad idea. There are much better ways of protecting your log cabin, as well as decorating them. In this guide I’ll explain exactly why you shouldn’t paint a log cabin, why paint leads to rotting and most importantly, I’ll be providing a better solution to paint. Before we begin, I just want to make it clear that you CAN paint a log cabin. It’s possible and isn’t the worse thing on earth. It’s just highly recommended that you don’t. 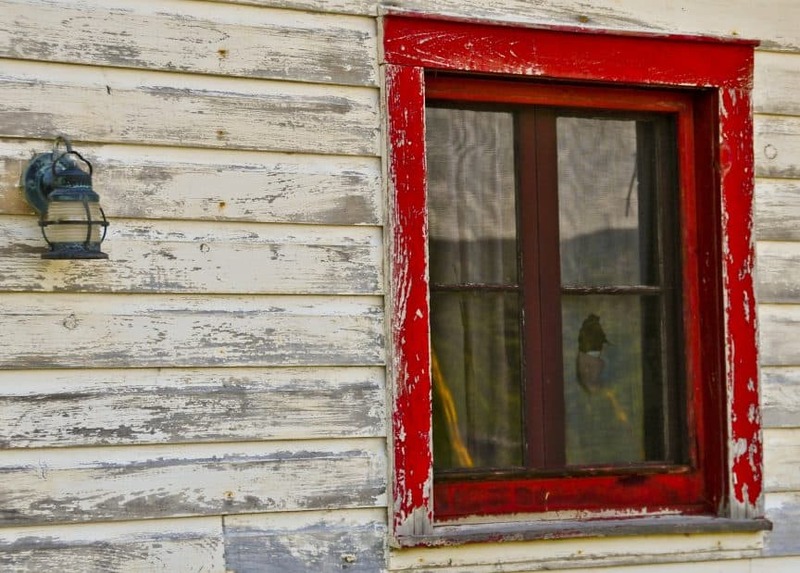 Paint can decrease the life-span of your log cabin. Therefore, if you want your cabin to last you for many years then it’s better NOT to use paint. As I mentioned previously, paint is known to protect materials such as metals from rusting however logs are a lot different to other forms of building materials. Wooden planks and dimensional lumber can be painted without problem. The problem with logs is that they contain a lot of moisture. Logs are a lot thicker than materials like dimensional lumber. They also consist of the full tree rather than just a cross section. This results in the logs having a retaining a lot of moisture. This makes it important that logs are left to dry for a year or two before they’re used for construction. This is good practice, though it won’t purge all the moisture hidden inside each log. No matter how long you’ve had your log cabin, the logs will never completely dry. Moisture from the air can be absorbed by the logs. This means that even in dryer seasons, they’re at-least getting a little bit of moisture. This means no matter how many years you let the logs ‘dry’, they’ll need be completely dry. The reason why painting your log cabin is a bad idea is because paint seals the logs, preventing moisture from coming in and out. Sounds like a good thing, though right? No more moisture can come in. But no, it’s bad because logs need to be able to breath. The paint seals the moisture so that it’s trapped inside the log. Logs need to have the ability to breath, otherwise this leads to rotting. Regardless of the type of paint (Latex or Oil), it will still cause damage to your cabin’s logs. Paint will cause your logs to rot from the inside. Anything which creates a hard or shell-like coating over the logs will cause rotting for the exact reason. The logs need to be able to breath. Do Logs Really Rot When Painted? So, we’ve just concluded that using paint on logs will cause rotting. The rotting is caused by the paint trapping moisture inside the log. You may have noticed when moving old logs which have been sitting on moist ground for long periods of time often have a decayed underside. This is because of the moisture. This is also what happens to the inside of logs when moisture is trapped inside. Imagine the logs which your cabin consists of, rotting from the inside out. This will cause them to work ineffectively and ruin your cabins insulation. A weak log won’t insulate your home and will be vulnerable to the elements. Some heavy rain or snow could cause the log to give in and collapse. This would result in you having to completely rebuild your cabin. 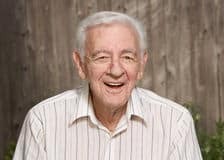 It is possible to identify rotting early, which would result in you only having to replace a few logs. But this is extremely difficult and can be very costly. For this job, you’d have to get rid of sections of log to get purge all the rot out of your cabin. If any rot is left, it will spread and be just as bad as it were before. Log will then have to be cut to fill in the cut-out sections. This isn’t easy, and repairs can be expensive. After all repairs have been paid for and made, you’ll still have to get rid of all the paint which caused the problem in the first place. This usually involves sandblasting the logs. And once the process is complete, the logs will have to be stained. I’d recommend NOT painting your cabin and avoiding all this headache. Now I’ll be explaining what you can do to protect your log cabin instead of painting it. Instead of painting, you should stain your log cabin instead. 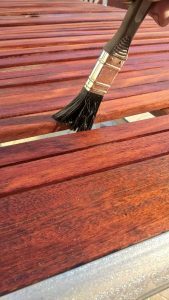 Staining works in a different way than paint does. It’s doesn’t create a sealing coat that will trap moisture inside the logs. Instead it will make the wood more resistant to harsh elements. It will protect the logs and reject a lot of moisture from the elements such as snow and rain. So, it will provide some protection to your logs without completely sealing them off and trapping moisture inside. This means that the logs are still able to breath, and thus prevent moisture from being trapped inside. All this means that the logs will be significantly dryer which results in less rot. Wood being an organic resource, it will not last forever. Staining will not make your logs invisible however they’ll last MUCH longer if properly stained. Paint will shorten the life-span of logs as it will increase the speed of rotting. Staining protects your logs, whilst still allowing them to breath. In conclusion, staining your log cabin is the better option opposed to painting it. What stain should I use for my cabin? Well, there are two types of stain. Oil and water-based. You’ll also need to do your research into the specific product you decide to purchase. Some products will work better in humid climates, whereas some work better in dry climates. 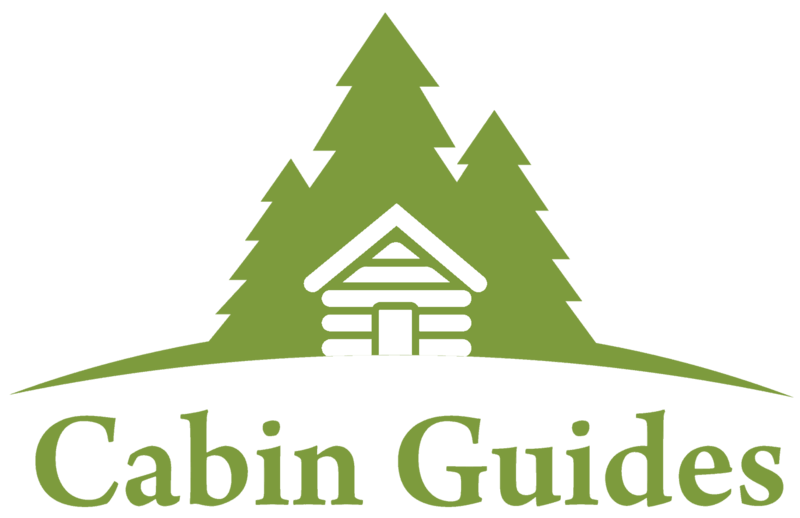 I may write a guide on finding the right stain for your cabin in the future, If I do so I’ll ensure I edit this guide with the link. For now, I’d recommend Sashco Capture Log Stain. This is a stain designed for wood homes. It’s also an oil in water hybrid formula. Regardless of the stain you decide to purchase, you should get one which is designed for log homes. This is very important as obviously these stains will work more effectively on logs. Also, go for a well-known or highly reputable brand. Top-brands will be more expensive however this is often because they provide high quality products. There are many more ways to preserve your log cabin and make it last a lot longer. It’s important that you protect your investment. I’ll end this guide off with a few extra tips on how to make your home last you many, many years. Don’t let snow sit on your wood: During the snowy seasons, it’s important that you don’t let the snow sit on your cabin for too long. When possible, shovel it away. Snow will provide additional moisture which your logs won’t benefit from. If snow is left of a pressure-treated or rot-resistant deck, it will rot even faster than an untreated deck that is regularly shovelled. Build on stone or cement: It’s important that your cabin is built on a cement or stone foundation. The wood of your cabin should never touch the ground. This is standard practise and hopefully you’ve done just that. Build on high ground: This is another tip for those who haven’t yet built their cabin. It’s always a good idea to build on high and well-drained ground. If your cabin is on low ground, then moisture could drain down onto your property and rot out your logs. Whereas, if you’re on the high ground then moisture is drained away from your home.